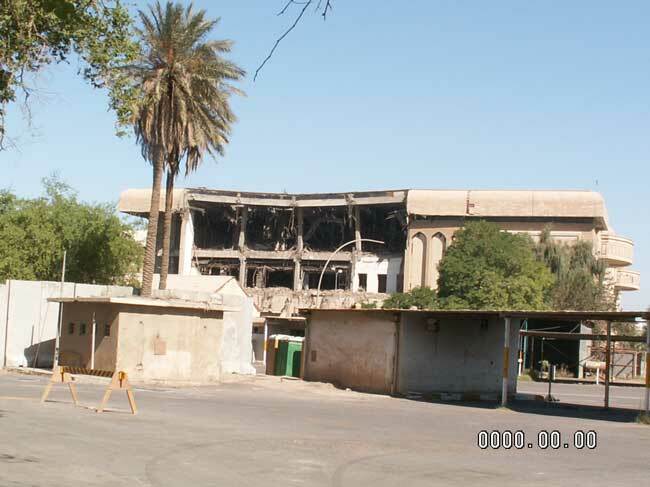 Talking about the post-military context and informal re-purposing of weapons designed for war, how about the legacy of Saddam's Hussein's subversive architecture finding new use as a military urban tourist trap? 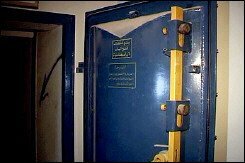 Could he be luring unsuspecting occupiers down into the bowels of something that may still wait to be activated, while he, now contained in a U.S. detention cell, wrangles with Iraqi courts for his own life? That would be some last-minute Last Meal trick up his sleave if architecture ever saw one. Despite approximately seven 2000 pound bombs having struck the Believers' Palace in Baghdad in 2003, Saddam Hussein's underground bunker below the palace remained relatively undamaged. Today, buried under an obliterated garden of twisted metal, contorted steel, and a chunky landscape of exploded concrete and strewn palatial object debris, the underground safe zone has become an informal tourist attraction for visitors and residents of Baghdad's downtown Green Zone area. 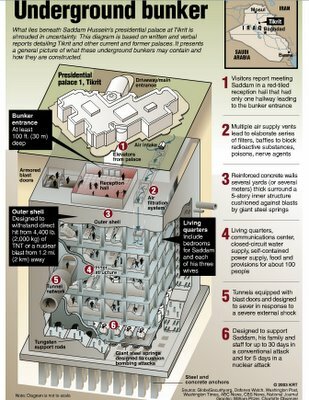 Karl Bernd Esser, Saddam's chief bunker architect, boasted just as the invasion began that his structure could survive anything short of a direct hit from a nuclear bomb. According to this article, "The palace was started in the late 1980s and completed in the 1990s, using funds provided by the United Nations’ oil-for-food program. It is a shattered wreck now. The building itself is fraudulent. 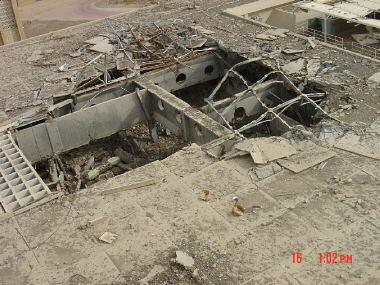 Its bottom floors are false, forming a great box filled at the time of its construction, by design, with rubble; nearly 15 meters of protection for the bunker beneath. Rubble, it turns out, has the interesting ability to dissipate bomb blasts." People's Daily describes the three-level sprawling bunker as "large enough to house 250 people. It has an air filtration system, a large kitchen and was fully prepared for an attack with biological or chemical weapons. It also has its own power supply. Its large generators, which are powerful enough to supply the whole Green Zone area with electricity, seem brand new. Between the Believers' Palace and the bunker was even more protection: a two-floor "plug" and reinforced helmet of sorts to make up for one of the bunkers shortcomings: it was barely underground." Now it is a reinforced concrete box inside a box, where "even to this day some of the rooms have an inch of putrid water with some type of biological life. "* Interesting, regardless, life continues to emerge at the bottom of one of the world's darkest fall-out wells. 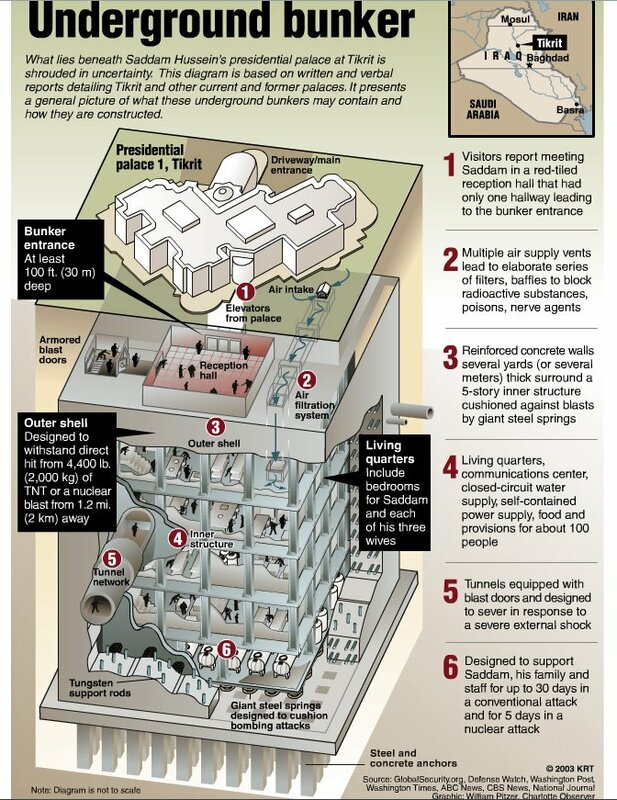 On the tour, it has been reported, that "at either end of the Believers’ Palace bunker, there is a decontamination chamber and a pair of blast doors. 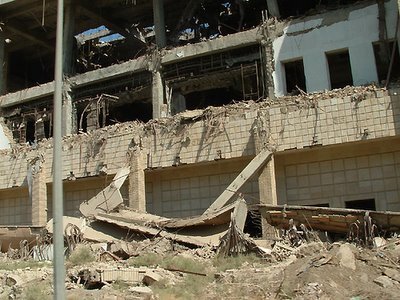 The second entry leads to a stairway that rises sharply around to another blast door and climbs three stories through the deliberate rubble layers until reaching the top floor of the building. Here there is rubble of a different sort. On one of the debris hills, embedded in the slopes, right side up, sits an ornate upholstered chair, somehow nearly undamaged, its survival as improbable as the emergence of Shadrach, Meshach, and Abednago unscathed from Belshazzar’s fiery oven in ancient Babylon. It is like a real life version of those pictures with something quite out of place, like a bird in a fishbowl in an otherwise ordinary scene. The chair is a marvel, a wonder, a sign that the most unexpected, unlikely things can happen. At the top of the cupola, at its very apex, is the perfectly placed, perfectly circular hole created by the bomb that destroyed this room and that created a deep crater in the very center of the floor. The bomb must have been accurate to within inches, an amazing feat of precision and demolition. The damage is symmetrical and mortifying all round the room." "The structure is so well built it would be difficult to demolish, and the massive palace above makes it impossible to bury." 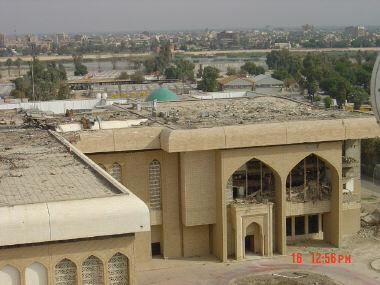 * So, what will the Iraqis do with these remnant war tombs? And how many are there through out the country? How many of them actually connect? What role could these underground spaces play in rebuilding efforts, or in future Iraqi urban design? How could they eventually be reused to reconnect a war torn culture with the identity of its city and architectural heritage, can they serve any future intent valuable to society at large? 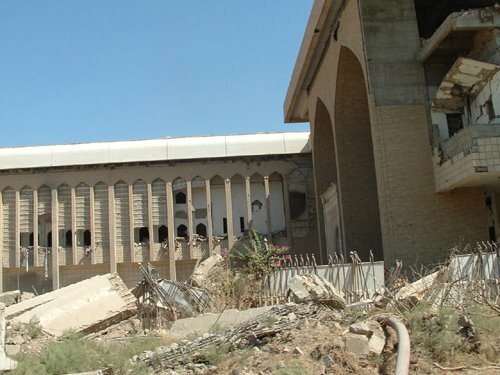 Like community-storage facilities, community-banks or underground vaults, archival projects... what positive impact may adaptive reuse and bunker preservation play in Iraqi determination of their own urban renewal? Just as I finished posting this, I came across an article in today's SF Gate. Wine makers in SF are leasing the Presidio Ammunitions Bunkers for wine storage. Not exactly the most progressive reuse, but the city does get to make some money off of a very obvious customer. Though, it's also kind of sad, because I love playing in these bunkers, and finding the rest of the public indulging in co-opting them for their own contexts. I think that ultimately is the best option, leaving them open to the public to let informality do it's thing, to serve our cultural pathololgy and secret-love affair with bunker-snooping. So many crazy times to be had in the belly of the bunker. I would fight any wine distributor's attempt to take over all the bunkers. Oh yes I would. The BBC got permission to take a quick tour, with some video footage.